Hungry Howie's Pizza franchise business opportunity. Free Hungry Howie's Pizza business franchise information. 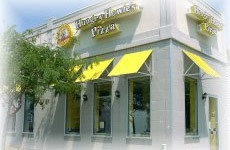 Hungry Howie's Pizza is a proven, full-service delivery and carry-out pizza company. We are a major competitor in the pizza franchise industry so if you're searching for a lucrative opportunity - look no further! Our commitment to quality and to our franchisees is second to none and this is reflected by the awards we have achieved over the years. In 1999, Pizza Today Magazine confirmed our status as the nation's ninth largest pizza franchise operation. By 2004 they named us Chain of the Year. We're looking for the right people to continue the high standards we have set so if you've got the determination to succeed, we want to hear from you. 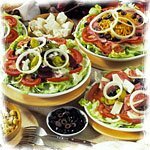 At Hungry Howie's we have combined the right ingredients and years of successful experience to create a superb, growth-oriented business operation. 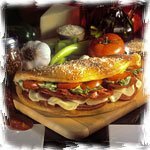 Our delicious, high-quality Flavored Crust pizzas, oven baked subs and salads uniquely position Hungry Howie's in the pizza marketplace, allowing us to fully capitalize on the fastest growing segment of the food service industry. Hungry Howie's has been included in Franchise Times Top 200 and Entrepreneur Magazine's Annual Franchise 500. Hungry Howie's is a dominant force in the pizza marketplace - positioning itself in the toughest of business markets through the quality of its product and the success of its delivery operations. Company president, Steven Jackson, says, "It takes a fierce desire to succeed in one of the toughest food segments. Major elements in our strategy include excellent products, superior customer service and the marketing savvy to compete against the national pizza chains." As you explore the investment opportunities at Hungry Howie's, you will realize the intense commitment we've made to our products, our market and our store owners. From the beginning, you'll benefit from the expertise of our seasoned franchise development team. These proven professionals are committed to the continuing growth and expansion of your store and our franchise system. We currently have franchise opportunities in many states in the <?xml:namespace prefix = st1 ns = "urn:schemas-microsoft-com:office:smarttags" />US and internationally for multi-unit ownership. To learn more about the Hungry Howie's Pizza franchise opportunity, simply complete the form below.